The enclosed lines are from some notes of my mother's which I did not know existed and ran across rather by accident a few days ago notes concerning her studying medicine and the beginfling of her practice here as the pioneer woman physician in Virginia. Her father, Dr. Robert Chenault, of Lexington, Ky. had violently objected to her studying medicine because she was too "delicate" and could not stand the rigors of a doctor's life, but she taught English for a while in the college from which she had graduated until she had enough money at least to start this study for which she yearned. She came here to practise as Dr. Emily Chenault Runyon, after my father's death ended their less-than-five-years of marriage. To your grandfather, at Ann Arbor, she was, of course, Emily Chenault. I remember you as a very little boy, and until the last few years I kept in touch with your mother. I had not realized she was ill. If you can, give her my love. 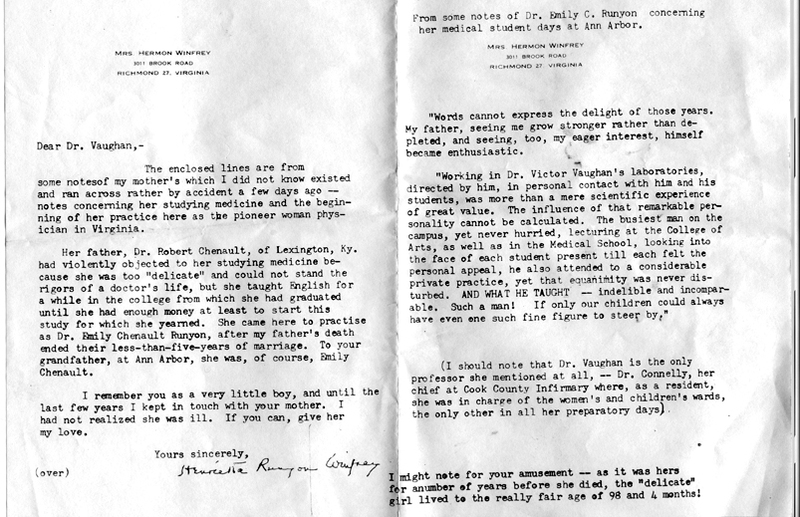 From some notes of Dr. Emily C. Runyon concerning her medical student days at Ann Arbor. "Words cannot express the delight of those years. My father, seeing me grow stronger rather than depleted, and seeing, too, my eager interest, himself became enthusiastic. "Working in Dr. Victor Vaughan's laboratories, directed by him, in personal contact with him and his students, was more than a mere scientific experience of great value. The influence of that remarkable per- sonality cannot be calculated. The busiest man on the campus, yet never hurried, lecturing at the College of Arts, as well as in the Medical School, looking into the face of each student present till each felt the personal appeal, he also attended to a considerable private practice, yet that equanimity was never dis- turbed. AND WHAT HE TAUGHT - indelible and incompar- able. Such a man! If only our children could always have even one such fine figure to steer by." I might note for your amusement -- as it was hers for a number of years before she died, the "delicate" girl lived to the really fair age of 98 and 4 months!